Morocco is one of the world’s most exotic and exciting holiday destinations that you are likely to travel to. A gateway between Europe and Africa, with beautiful mountains, desert and coast, where ancient medina lanes lead to souks and riads. From Saharan dunes to the peaks of the high Atlas, Morocco is tailor made for wild hearted travellers. Morocco has an abundance of important natural and historical assets, not to mention a rich and diverse cultural heritage. From Casablanca through Rabat and to Tangier at the tip of the continent; through the infinite blue labyrinth streets of Chefchaouen, and down to Fez, and still further south to the ever-spreading dunes of Erg Chebbi in the Sahara Desert; over to Marrakesh, and the laid-back coastal town of Essaouira. Whether you base yourself near the bustling centre of Marrakech or the beach resorts of El Jadida and Agadir, the quality of golf in Morocco is superb, not least at the renowned Mazagan Beach, Samanah and Palmeraie. Old meets new in Marrakech, where the varied architecture sees traditional structures coexist with contemporary design, and the cuisine is a blend of entrenched local flavours and modern international trends. Marrakech is a city unlike any other: nowhere is exoticism better showcased than in this ochre-and-rose-hued North African hive of activity. 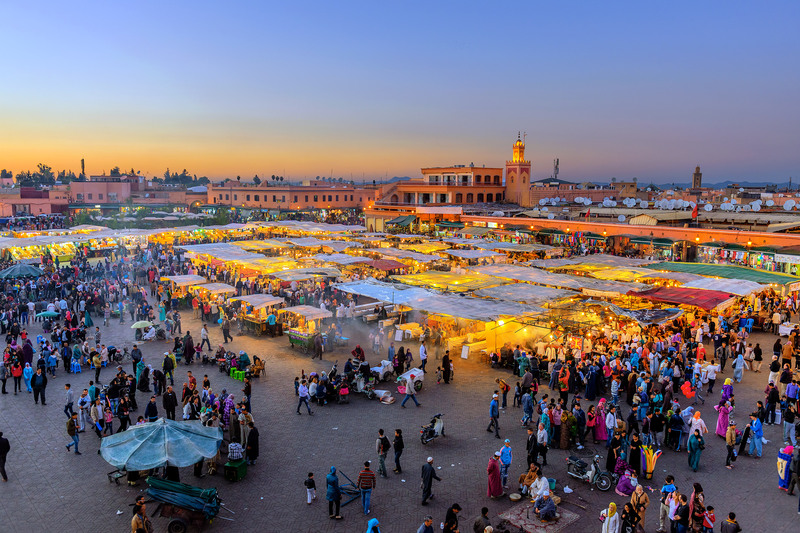 Indulge in a hammam at your tile-and-tadelakt riad before bartering for treasures in the kaleidoscopic souks, then snack on pigeon pie from a stall in the grand place, amid snake charmers and belly-dancers. To escape the hurly burly of the medina, sup on tajine and couscous in a chic cushion-filled restaurant in the Kasbah, or sip Cristal by candlelight in a hip muslin-draped, after-hours hang-out in the new town of Guéliz.